Whether or not you play competitive sports, I would bet that most of you at least engage in regular exercise or other athletic activity. Unfortunately you also get sick occasionally. I have previously offered suggestions for safely exercising and playing sports when you’re sick. In this post, I would specifically like to focus on antibiotics. Athletes take oral antibiotics more than twice as often as non-athletes. Maybe the team doctors are trying to get them back to sports as soon as possible. Maybe active people fear an infection worsening and keeping them from training. 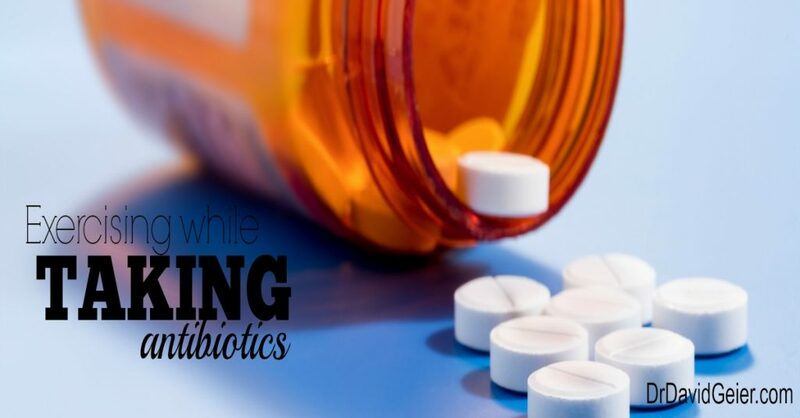 A new review article published in Sports Health offers some warnings and possible side effects from commonly used antibiotics. Since many of us take antibiotics, even when we are training or competing, it is worthwhile to summarize the authors’ findings here. No antibiotic complication among athletes has received more attention then the risk of tendon rupture from fluoroquinolones. This category of drugs includes ciprofloxacin (Cipro) and levofloxacin (Levaquin). They are often used to treat urinary infections. While all tendons could potentially be affected, the Achilles tendon might be most at risk. Patients who take these medications appear to have 3 to 6 times increased risk of Achilles tendon rupture. Doctors might consider using different antibiotics in athletes. Athletic people should inquire about the risk of tendinitis and tendon rupture before taking these antibiotics. Antibiotic-associated diarrhea can occur with many types of antibiotics. These medications can alter the normal bacteria in the G.I. system. In order to decrease the chance of diarrhea, healthcare professionals could keep duration of antibiotic treatment to as short a period as possible that would eliminate the infection. Using certain broad-spectrum antibiotics might increase this risk. Doctors could use more narrow-spectrum medications if possible. Certain antibiotics present an increased risk of heart arrhythmias (abnormal heartbeats or electrical patterns). Prolonged QT interval is an example of one of the possible cardiac changes. Azithromycin, clarithromycin, fluoroquinolones and others carry these risks. It is important that a sports medicine doctor who performs pre-participation physical exams ask about antibiotic use if he detects one of these arrhythmias. Also patients with underlying heart or the medical conditions could have increased risk with these antibiotics. An athlete who competes in outdoor sports or who exercises or trains outdoors could suffer a photosensitivity reaction. Tetracyclines, sulfa drugs and fluoroquinolones present this risk. She could develop a serious sunburn on body parts exposed to the sun. She could also have increased risk of skin cancer. An athlete who will compete in the sun should avoid these antibiotics or use sunscreen and wear fully protective clothing. Many antibiotics could possibly cause fatigue or decreased performance. It is difficult to know if this is a side effect of the antibiotic or a result of the underlying illness. If an athletic or active individual has an infection and requires antibiotic treatment, she should ask the doctor about possible complications with those drugs, especially as they pertain to exercise and sports. This post is in no way meant to offer specific medical advice, so please consult your doctor with specific questions. Fayock K, Voltz M, Sandella B, Close J, Lunser M, Okun J. Antibiotic precautions in athletes. Sports Health: A Multidisciplinary Approach. Published online ahead of print September 26, 2013.